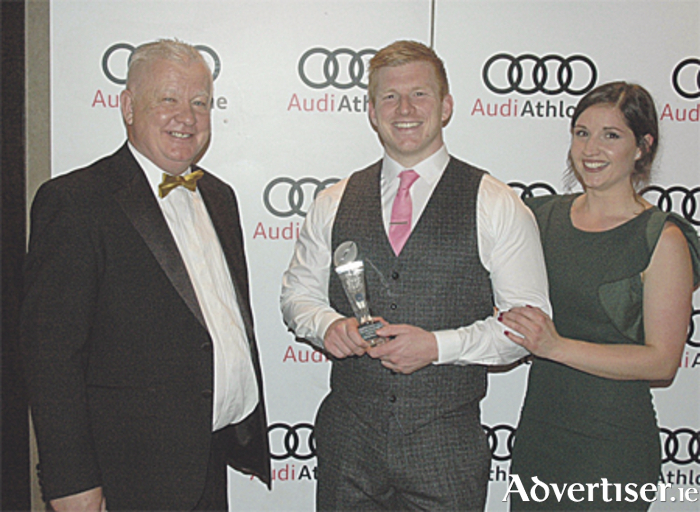 Jordan Conroy and Tom Conlon were the main winners at Buccaneers Rugby Football Club’s annual awards event held at the Sheraton Athlone Hotel last Saturday night, May 13. Conroy, in his debut season with the club, won the Senior Player of the Year accolade, while senior team manager Conlon was awarded the Buccaneers Club Person of the Year accolade. Welcoming those in attendance, club president Eddie Walsh reflected on a very successful season that culminated in winning the Ulster Bank League Division 1B and also completing a Connacht Senior League and Cup double, while a number of underage teams also enjoyed memorable campaigns. He thanked the Sheraton Athlone Hotel and the event’s organisers, particularly Lorna Stuart-Trainor and Geraldine Kenny, and also paid tribute to the club’s benefactors, especially the Moore family at Audi Athlone and Dubarry of Ireland. Head coach Brett Wilkinson thanked all the club’s volunteers from underage up, and the committees who freely give so much time to the club. In his breakthrough season, Athlone Institute of Technology student Conroy made a massive impact. He scored 18 tries, a key factor in the Pirates sailing to the Division 1B league title and promotion to the top flight. The young Tullamore speedster also caught the attention at provincial and national levels, playing for Connacht Eagles and for the Ireland Sevens squad. Ross Cooper, skipper of the U20s, was named U20s Player of the Year, while Dean McMahon was named Most Improved U20s Player. Captain Rory Grenham was a worthy recipient of the Buccaneers Seconds Player of the Year Award, with James O’Connell being named Most Improved Seconds Player of the Year. Lorna Stuart-Trainor was named Buccaneers Women’s Player of the Year, while Aileen Hayes gathered the Most Improved Women’s Player of the Year accolade. Derek Ryan’s endeavours fully justified his being honoured as Youths Volunteer of the Year, with Emily Duffy named Minis Volunteer of the Year. All the winners receive specially commissioned pieces of Athlone Crystal. The final presentation at the Buccaneers awards event was, in the club president’s view, “the most prestigious award”. Tommy Conlon was unveiled as this year’s Club Person of the Year. Not normally known as a shrinking violet, he was stunned and speechless by the announcement which was greeted with a standing ovation.